Retail Price of $19.95...Only $15.00! This video interview with Joel DeLuca, the Author of Political Savvy provides insight into the research and Political Savvy frame of mind. This little books imparts the wisdom of political savvy to managers and other busy executives that need a summary of ideas and ways to manage change in an organization. Retail Price of $18.50...Only $15.75! Provides proven strategies & techniques for getting things done in any organization. Retail Price of $24.95...Only $17.95! Great for the executive on the go, listen and learn the proven strategies and techniques of the politically savvy on your computer, ipod or mp3 car stereo. Download the book today by purchasing the pdf and read it on your laptop or print it to read or refer to portions in the everyday corporate world. Order Today! Political Savvy - Systematic Approaches to Leadership Behind-the-Scenes (Hardcover), by Joel R. DeLuca, Ph.D.
ORDER Today for only $15.75, a 15% savings. This book provides proven strategies and techniques for ethically mastering organizational politics. It will shed beneficial light on this dark and often taboo topic. It is not one of the three major types of books on this topic: tips and tactics, interview based, academic theories. It is based on decades of research and insider practice. It takes the results and presents them in a clear and easy to read manner. It is for those serious about making a difference with their work lives while maximizing their career success. One of the most common and gratifying comments we receive is "I wish I had this book earlier in my career." Overcoming Resistance to Change, Joel R. DeLuca, Ph.D. This little book distills the key lessons of implementing change into a concise 29 pages. Its direct, blunt approach appeals to many who want to understand change management without any frills. The principles highlighted are the key 20% that drive the 80% of successful change. This "gem of a book" cuts to the core of one of the most difficult aspects managers face in keeping pace with rapid change. If you practice these straightforward principles, you will gain the mastery of change. It's an excellent companion for the Political Savvy book. Audio Book of Political Savvy - MP3 download version! (Audio Book MP3 version), by Joel R. DeLuca, Ph.D.
ORDER for $17.95, a 28% savings. In it's entirety or chapter by chapter. You pay absolutely no shipping or handling fees! This Video Interview with the Author of Political Savvy provides insight into the research and Political Savvy frame of mind. Package Options from Political Savvy! This package will provide a great deal of knowledge on being politically adept in any organization based on decades of real world research. 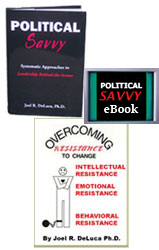 Gain the proven benefits from the Savvy Advantage™ using various forms of Political Savvy research, books, seminars and coaching. Contact us if you have interests in the above issues or with dilemmas you are currently facing concerning organizational politics.